Polar Desert Center, Florida State University, Tallahassee, Fl, 1995-1997. OPP-9420227. Cooperative Research: «Living and Fossil Microorganisms, a Sensitive Paleoclimate Indicator in the McMurdo Dry Valleys» (Dr. E.I. Friedmann, supervisor). Rivkina, E., Petrovskaya, L., Vishnivetskaya, T., Krivushin, K., Shmakova, L., Tutukina, M., Meyers, A., and Kondrashov, F. Metagenomic analyses of the late Pleistocene permafrost – additional tools for reconstruction of environmental conditions, Biogeosciences, 13, 2207-2219, doi:10.5194/bg-13-2207-2016, 2016. Rivkina, E., Petrovskaya, L., Vishnivetskaya, T., Krivushin, K., Shmakova, L., Tutukina, M., Meyers, A., and Kondrashov, F.: Metagenomic analyses of the late Pleistocene permafrost – additional tools for reconstruction of environmental conditions, Biogeosciences Discuss., 12, 12091-12119, doi:10.5194/bgd-12-12091-2015, 2015. Viktoria Shcherbakova, Natalia Chuvilskaya, Elizaveta Rivkina, Nikita Demidov, Victoria Uchaeva, Stanislav Suetin, Nataliya Suzina, and David Gilichinsky (2013) Celerinatantimonas yamalensis sp. nov., a cold-adapted diazotrophic bacterium from a cold permafrost brine. Int.Journal Syst Evol Microbiology 63: 4421-4427. Ksenia Novototskaya-Vlasova, Lada Petrovskaya, Elena Kryukova, Elizaveta Rivkina, Dmitry Dolgikh, Mikhail Kirpichnikov. (2013) “Expression and chaperone-assisted refolding of a new cold-active lipase from Psychrobacter cryohalolentis K5T”. Protein expression and purification, vol.91: 96-103. Novototskaya-Vlasova K.A., Petrovskaya L.E., Rivkina E.M., Dolgikh D.A., Kirpichnikov M.P. (2013). Characterization of coldactive lipase of Psychrobacter cryohalolentis K5T and its deletion mutants. Biochemistry, V78, no. 4, p. 501 — 512. Шмелев Д.Г., Краев Г.Н., Веремеева А.А., Ривкина ЕМ (2013). Содержание углерода в мерзлых отложениях северо-востока Якутии.// Криосфера Земли XVII, 50-59. Миронов В. А., Щербакова В. А., Ривкина Е.М., Гиличинский Д.А. (2013). Термофильные бактерии рода Geobacillus из многолетнемерзлых вулканических отложений // Микробиология 82, 372–375. Краев,Г. Н., Шульце, Э.Д., Ривкина, Е.М (2013). Криогенез как фактор распределение метана в горизонтах мерзлых пород // Доклады Академии Наук, Серия География 451, 1-4. Shcherbakova V, Rivkina E, Pecheritsyna S, Laurinavichius K, Suzina N, Gilichinsky D (2011) Methanobacterium arcticum sp. nov., a methanogenic archaeon from Holocene Arctic permafrost. Int J Syst Evol Microbiol, 61:144-147. Suetin S, Shcherbakova V, Chuvilskaya N, Rivkina E, Suzina N, Lysenko A & Gilichinsky D (2009) Clostridium tagluense sp. nov., a psychrotolerant, anaerobic, spore-forming bacterium from permafrost. International Journal of Systematic and Evolutionary Microbiology 59: 1421. Shcherbakova VA, , N. A. Chuvil’skaya, E. M. Rivkina, S. A. Pecheritsyna, S. V. Suetin, K. S. Laurinavichius, A. M. Lysenko, and D. A. Gilichinsky (2009) Novel Halotolerant Bacterium from Cryopeg in Permafrost: Description of Psychrobacter muriicola sp. nov. Microbiology 78: 84-91 (in Russian). Gilichinsky, D., E. Rivkina, K. Laurinavichius, E. Vorobyоva, C. McKay (2003). Permafrost frontiers of life. Frontiers of life (eds. L. Celnikier, Tran Thanh Van) 99-105. Gilichinsky D, Rivkina E, Shcherbakova V, Laurinavichuis K & Tiedje J (2003) Supercooled water brines within permafrost-an unknown ecological niche for microorganisms: a model for astrobiology. Astrobiology 3: 331-341. G. S. Wilson J.A. Barron, A. C. Ashworth, R. A. Askin, J. A. Carter, M. G. Curren, D. H. Dalhuisen, E. I. Friedmann, D. G. Fyodorov-Davidov, D. A. Gilichinsky, M. A. Harpere, D. M. Harwood, J. F. Hiemstra, T. R Janecek, K. J. Licht, V. E. Ostroumov, R. D. Powellm, E. M. Rivkina, S. A. Rose, A. P. Stroeven, P. Stroeven, J. J. M. van der Meero and M. C. Wizevich (2002) The Mount Feather Diamicton of the Sirius Group: an accumulation of indicators of Neogene Antarctic glacial and climatic history. Palaeogeography, Palaeoclimatology, Palaeoecology 182: 117-131. 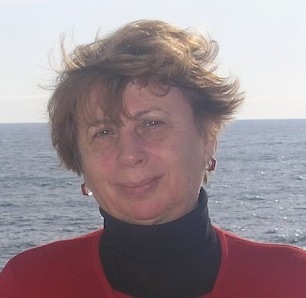 Vorobyova E, Soina V, Gorlenko M, Minkovskaya, N., Zalinova, N., Mamukelashvili, A., Gilichinsky, D., Rivkina, E., Vishnivetskaya, T. (1997) The deep cold biosphere: facts and hypothesis. FEMS Microbiology Reviews 20: 277-290. Zhou J, Davey, M. E., Figueras, J. B., Rivkina, E., Gilichinsky, D., Tiedje, J. M. (1997) Phylogenetic diversity of a bacterial community determined from Siberian tundra soil DNA. Microbiology 143 ( Pt 12): 3913-3919.